The Fenestration Australia Design Awards were held in Port Douglas, Queensland on the 21st September 2018. 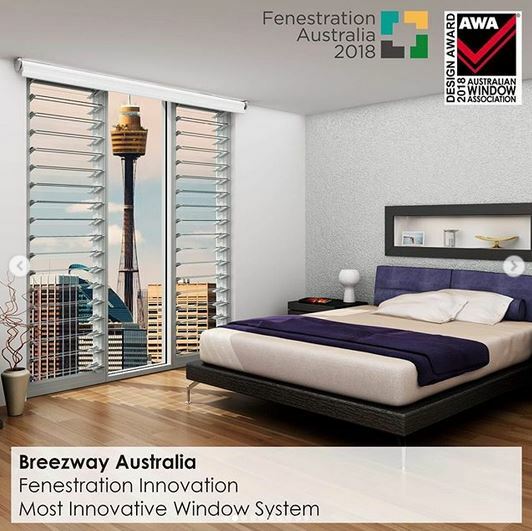 Breezway is proud to announce we were awarded ‘Most Innovative Window System’ for our new Secondary Glazed Altair Dualair Louvre System that was only launched earlier this year in May for the Australian market. 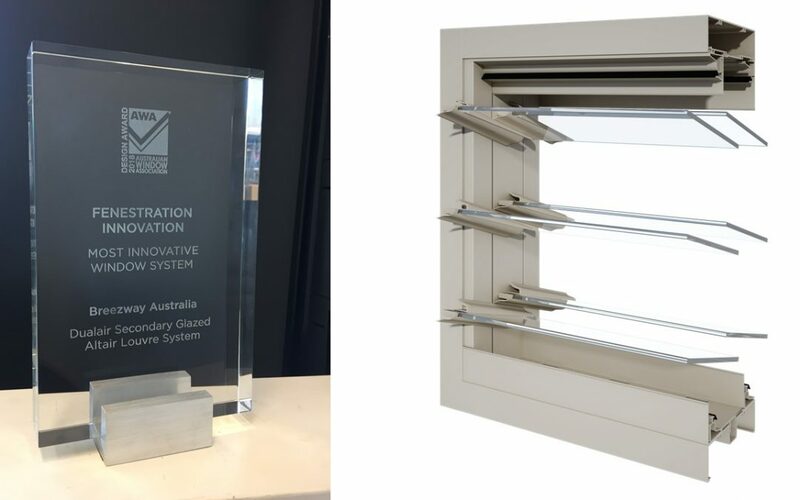 This award from the Australian Window Association recognises products which distinctly take into account growing issues that are present in today’s market – solar, thermal, noise, security and environmental factors. By placing two Altair Louvre Galleries in the one 150mm commercial frame has resulted in a system that can improve a number of things – water penetration resistance, energy efficiency and acoustic performance while still allowing for maximum ventilation. The Dualair System was quoted by the Judges as “Stylish” and “Effective”, making it the ideal window solution for your next high end residential or commercial building design. (Images above were taken at the Design Awards featuring Breezway’s Marketing Manager Clinton Dickens accepting the award alongside FNQ Area Manager Gavin Heriot, Sales Manager Tom Moring and Executive Director & CEO of the AWA Tracey Gramlick). 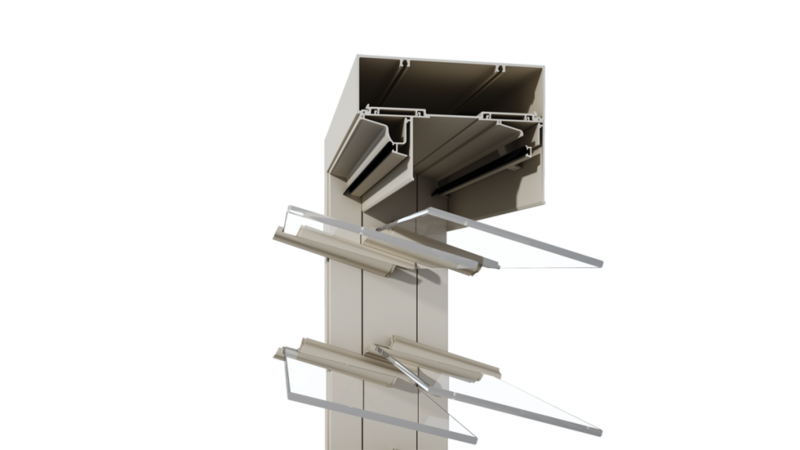 The Dualair System is optimised for water penetration resistance where slots are machined in the outer head weatherstrip insert to allow some pressure equalisation so that the outer louvre acts as a rain screen and the inner louvre resists air pressure. If there is a need for the System to be optimised for high airborne sound isolation please contact Breezway for more information. The Dualair System now allows maximum ventilation to be delivered into projects where performance requirements previously prevented the use of single glazed louvre windows. Airborne sound isolation ratings have increase from Rw’28 (single glazed Altair Louvre) to Rw’35 (Dualair System). Maximum water penetration resistance has increased from 450Pa to 620Pa. Lowest possible u-values in an aluminium frame have improved from 4.3 w/m2.k (brz-003-13) to 2.4W/m2.k (brz-011-03) which is comparable to high performance double glazing in a thermally broken frame. The Dualair System is installed as a single unit, allowing a single installation occasion into a single run of sub-framing (secondary glazed windows are more commonly installed on two separate occasions). With both the inner and outer window types being identical, the Dualair System offers the appearance of a single window unit (secondary glazed windows are often a different window type to the primary window). For more information please visit our Dualair System page or call 1800 777 758 to discuss your upcoming projects.